Just 4x4s is the country’s most comprehensive marketplace for 4x4s, SUVs, caravans, boats and camping gear. If you’re into the outdoors, then get into a subscription of this magazine. Whether you’re looking to buy, sell or just dream, there’s no better place to find the right vehicle for your next adventure, or to find a like-minded mate who’s going to take care of yours if you need to sell it. 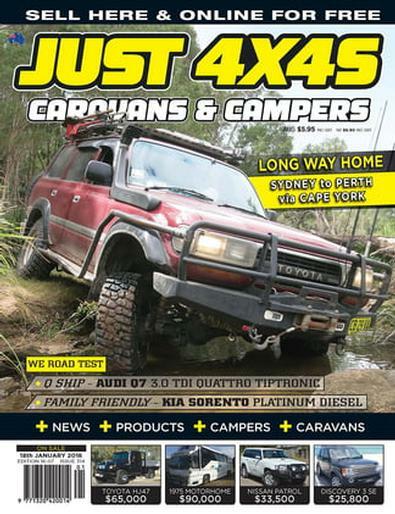 A subscription to JUST 4x4s is the most convenient way to get your copy of the country’s largest selling classified mag for outdoor enthusiasts.NOTE: JUST MAGAZINES DO NOT guarantee early (ie. before the newsagents on-sale date) delivery of any JUST MAGAZINES publication. While JUST MAGAZINES does endeavour to get all subscriptions to recipients on the published on-sale date of each relevant publication, we cannot allow for delays or any other problems with the postal system. JUST MAGAZINES will accept no responsibility for lost, late or misdirected magazines sent through the postal system. I have found that any magazine I am interested in is available at great prices.